Paris's Louvre vies with New York's Metropolitan Museum as the world's greatest all-around art museum. France's esteemed art house has the distinction of having the world's most famous painting: Mona Lisa by the Italian Renaissance master Leonardo da Vinci. 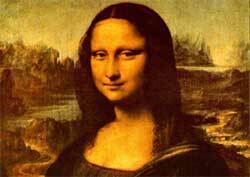 Mona Lisa's subtle, enigmatic smile and stare (see photo) have intrigued billions. The celebrated Hellenistic marble statues Venus de Milo and Winged Victory of Samothrace are also in the Louvre Museum. There are tens of thousands of other masterpieces from around the globe. The Louvre attracts about 10 million visitors per year. Runners-up are the Metropolitan Museum in New York (about 6 million) and the British Museum in London (slightly less). The art treasures of the Louvre Museum cover 5,000 years and are displayed in over 10 kilometers (6 miles) of galleries. The building complex metamorphosed and expanded over eight centuries. It began as a medieval fortress (12th century) that was transformed into a royal palace (16th) and then a public museum (18th). In recent decades, the Louvre Museum undertook a major renovation project. The most striking addition was architect I.M. Pei's 1989 modern glass pyramid (most people like it but some despise it).